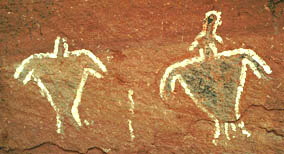 The Puebloan culture produced much of the rock art of southeastern Utah. The Puebloan culture flourished in the Four Corners region. It developed from the Archaic with influence from the Hohokam of southern Arizona and the Mogollon. Permanent dwellings and corn and squash cultivation distinguish the Puebloan cultures from the Archaic. The earliest Puebloan are termed Basketmaker; the later periods are called Puebloan. Richard Wetherill first described the Basketmakers after unearthing many skeletons associated with high quality woven baskets in southeast Utah caves, particularly in Grand Gulch. A great number of Puebloan rock art sites are located on Cedar Mesa in Southeastern Utah along a 40 mile section of Grand Gulch, a BLM managed Primitive Area. The canyon and its tributaries are unrivaled in their quantity of Basketmaker pictography. Many unique images are found. More so than elsewhere in Utah, a proliferation of pictograph colors occurs. Like the Classic Vernal anthropomorphs, the Grand Gulch Basketmaker figures are also large with broad shoulders and diminutive appendages. Earbob, necklace and belt adornments also occur. 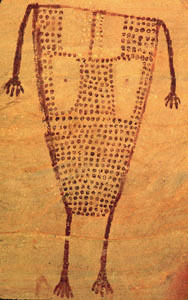 Archaic, Puebloan and other rock art styles are also known. The amount of rock art in Grand Gulch Primitive area is sufficient for a book, and certainly too much to convey here. I shall discuss some of the most dynamic panels and highlight a few others. There are also well preserved architectural remains sheltered in the deep canyon's alcoves and overhangs, often in association with the rock art sites. The canyon is only accessible to hikers willing to walk long distances. Grand Gulch Primitive Area is backcountry and hikers may need to register with the BLM in Monticello. The Kane Gulch Ranger Station is located along Utah Highway 261 about four miles south of Highway 95, not far from Natural Bridges National Monument. The Ranger Station is also the trailhead to Grand Gulch via Kane Springs Wash. The sequence of this presentation begins at the upper end of the canyon. Mileage is measured from Kane Gulch Ranger Station and derives from the area map published by the BLM and the Canyonlands Natural History Association. Much of Grand Gulch is a deep, sheer-walled canyon with very few access points. A large red snake is found near a ruin and several anthropomorphs decorate the cliffs in Kane Springs Wash. At Junction Ruin, about four miles in, dozens of red and white handprints are seen. Turkey Pen Ruin features two very vivid white anthropomorphs (illustrated above) on the cliff near the kiva ruin. There are also several sheep, geometric figures and the usual handprints. Human remains were extracted from this site by Richard Wetherill. Several anthropomorphs are seen at Two Story Ruin. At Lion Track Ruin, named for the petroglyph, hundreds of handprints were painted along with sheep and anthropomorphs. At Split Level Ruin a very old petroglyph panel occurs (mile 10). The Basketmaker anthropomorphs in the lower portion are in groups, have stylized heads, are painted in white and vary from faint to very faint. The very faintest are partially overpainted in red, an accentuation by later era artists who also painted hand prints. Some of the white anthropomorphs are so faint they would go unnoticed without the superimposed red pictographs. 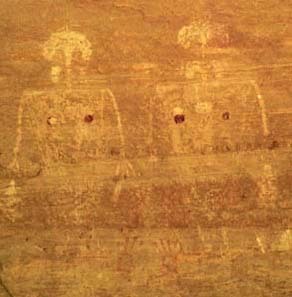 In the image above each red pictograph overlays a very faint white anthropomorphs. 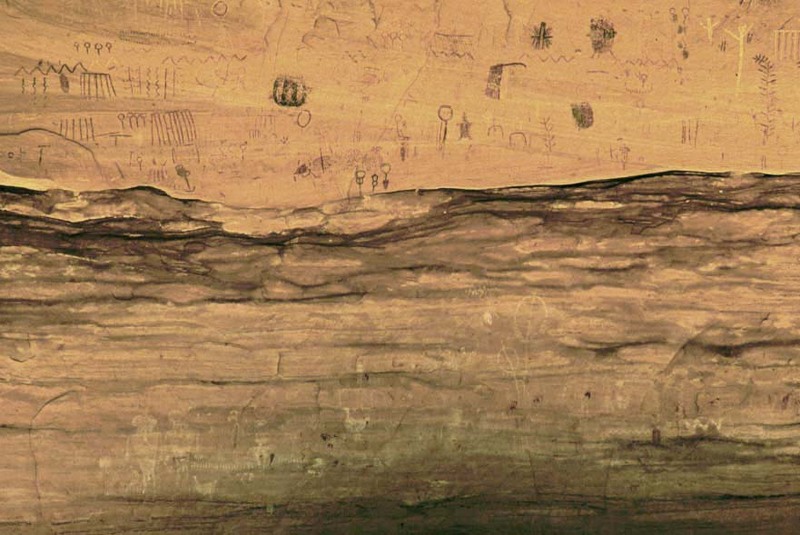 A close-up view of the figure on the left above follows below, together with a PhotoShop enhanced view of two faint anthropomorphs off to the right of the view above. Below the glyphs a spring flows from the rocks. Vertical sandstone cliffs rounded and worn smooth by the ages rise 500 feet above and all around the spring. Grand Gulch is an entrenched meander, a waterway that has slowly cut deeper and deeper into the Cedar Mesa sandstone along its primordial path. There is no way this wash can easily change course. The durable sandstone cliffs form an impassable barrier. Only a few paths have been found leading in and out of the canyon, and some of these are recommended only for experienced slickrock climbers. Only several of the side canyons offer entry points. One of these is Bullet Canyon. Bullet Canyon Spring, at the Junction of Grand Gulch and Bullet Canyon, is 15.6 miles from the Kane Springs Wash trailhead and 7.2 miles from the Bullet Canyon Trailhead. The Bullet Canyon Trailhead is about a mile from Highway 261. Jailhouse Ruin and Perfect Kiva Ruin are located between 2 and 3 miles up canyon in Bullet Canyon from the junction. There are some excellent anthropomorph pictographs in Bullet Canyon. I have not hiked this side canyon and cannot report more on this section. The mileages presented here are stream bed distances, not actual trail lengths. The hike from Kane Gulch trailhead to Bullet Canyon trailhead with side trips into the tributary canyons is a 26 to 28 mile walk. The Bullet Canyon Junction is a third of the distance to the San Juan River confluence from Kane Gulch. This virtual gallery and journey down Grand Gulch continues on the NEXT page.